No, this is not an attempt to incorporate safety culture into the ASME code. As introduced in Part 1 we want to offer a relatively simple construct for safety culture - hoping to provide a useful starting point for a model of safety culture and a bridge between safety culture as amorphous values and beliefs, and safety culture that helps achieve desired balances in outcomes. We propose that safety culture be considered “the willingness and ability of an organization to resist undue pressure on safety from competing business priorities”. Clearly this is a 30,000 foot view of safety culture and does not try to address the myriad ways in which it materializes within the organization. This is intentional since there are so many possible moving parts at the individual level making it too easy to lose sight of the macro forces. The arc of the plot line suggests that the safety/business threshold increases (requires greater business pressure) as safety culture becomes stronger. It also illustrates that safety priorities may be maintained even at lower safety culture strengths when there is little competing business pressure. This aspect seems particularly consistent with determinations at certain plants that safety culture is “adequate” but still requires strengthening. It also provides an appealing explanation for how complacency can over time erode a relatively strong safety culture . If overall performance is good, resulting in minimal business pressures, the culture might not be “challenged” or noticed even as culture becomes degraded. Another perspective on safety culture as pressure boundary is what happens when business pressure elevates to a point where the threshold is crossed. One reason that organizations with strong culture may be able to resist more pressure is a greater ability to manage business challenges that arise and/or a willingness to adjust business goals before they become overwhelming. And even at the threshold such organizations may be better able to identify compensatory actions that have only minimal and short term safety impacts. For organizations with weaker safety culture, the threshold may lead to more immediate and direct tradeoffs of safety priorities. In addition, the feedback effects of safety compromises (e.g., larger backlogs of unresolved problems) can compound business performance deficiencies and further increase business pressure. One possible insight from the pressure model is that in some cases, perceived safety culture issues may be more a situation of reasonably strong safety culture being over matched by excessive business pressures. The solution may be more about relieving business pressures than exclusively trying to reinforce culture. In Part 3 we hope to further develop this approach through some simple simulations that illustrate the interaction of managing resources and balancing pressures. In the meantime we would like to hear reactions from readers to this concept. Our June 12th post on the nature of decision making raised concerns about current perceptions of safety culture and the lack of a crisp mental model. We contended that decisions were the critical manifestation of safety culture and should be understood as an ongoing process to achieve superior performance across all key organizational assets. A recent post on LinkedIn by our friend Bill Mullins provided a real world example of this process from his days as a Rad Protection Manager. What would a model of safety culture look like? In terms of a model that describes how safety culture is operationalized, there is not much to cite. NEI has weighed in with a “safety culture process” diagram which may or may not be a model but includes elements such as CAP that one might expect to see in a model. A fundamental consideration of any model is how to represent safety culture; does safety culture “determine” actions taken by an organization (a causal relationship), or just provide a context within which actions are taken, or is it really a product, or integration, of the actions taken? Our own view is more in the direction of Cooper. We think safety culture can be thought of as a force or pressure within the organization to ensure that actions and decisions reflect safety. But safety competes with other forces arising from competing business goals, incentives and even personal interests. The actual actions and decisions turn on the combined balance of these various pressures. *** Over time the integrated effect of the actions manifest the true priority of safety, and thus the safety culture. * The link to the thread (including Bill's comment) is here. This may be difficult for readers who are not LinkedIn members to access. ** M.D. Cooper, “Toward a Model of Safety Culture,” Safety Science 36 (2000): 111-136. *** As summarized in an MIT Sloan Management Review article we blogged about on Sept. 1, 2010, “All decisions….are values-based. That is, a decision necessarily involves an implicit or explicit trade-off of values.” Safety culture is merely one of the values that is involved in this computation. As you know, Rep. Edward Markey (D-MA) is no friend of the NRC and has a record of complaining about NRC management practices and errors, retaliation against NRC employees who disagree with their managers, the other Commissioners outvoting outgoing Chairman Jazcko on post-Fukushima proposals,* etc. As a consequence, a new NRC-related emission from the Congressman’s office is of little interest to us. However, his June 4, 2012 letter to Chairman Jazcko** got our attention. While it recaps and supposedly updates prior complaints about the conduct of NRC managers and retaliation against employees, it also adds a couple of new items: (1) a claim that NRC employees don’t trust the NRC Inspector General (IG) to fairly investigate the issues previously raised and (2) a call for an independent investigation of the NRC’s safety culture (SC). I have not yet seen any NRC response to the Markey letter but it’s interesting to speculate how this might this play out. It would not surprise me if the NRC develops a two-pronged approach: (1) show support for their IG by assigning specific instances of alleged misconduct to the IG office for investigation and (2) create some sort of broader (agency-wide) initiative to reinforce SC policy and traits. Expect a lot of parsing, posturing and pronouncements, some retraining, and perhaps a reprimanded manager. It may also present an opportunity for incoming Chairman Macfarlane to articulate her understanding of and expectations for SC. Unfortunately, what you won’t see is an in-depth analysis of either the professional decision-making system that allows internal controversies to simmer until they boil over, or the real (as opposed to nominal) management reward system that encourages an agency middle manager to act in such an unprofessional manner (if indeed anyone did). Who would risk his career by downgrading findings and/or retaliating against subordinates unless there was some considerable agency or personal pressure to do so? But it’s not unthinkable. An earlier Markey letter, citing information received from NRC staff, points to an item in the regional plan, “which apparently awards Senior Executive Service bonuses in a manner that scales inversely with the number of enforcement actions that are challenged and overturned by licensees.”*** Is this a smoking gun or just someone blowing smoke? * Jaczko served as a Congressional Science Fellow in Rep. Markey’s office so the Congressman is likely complaining about the other Commissioners picking on his guy. ** Letter E.J. Markey to G. Jaczko Re: Region IV follow-up (June 4, 2012). *** Letter E.J. Markey to G. Jaczko Re: Texas Headquarters (May 9, 2012). This post may seem a bit on the abstract side of things but is intended to lay some foundation for future discussions on how to represent and model safety culture. We have posted previously about the various definitions of nuclear safety culture that are in vogue. Generally we find the definitions to be of limited value for at least two reasons: one, they focus on lists of desired traits and values but do not address the real conflicts and impediments to achieving those values; and two, they don’t illuminate how a strong safety culture comes about, or even whether it is something that can be actively managed. Recent discussions on some of the LinkedIn forums include lots of references to good leadership practices and the like, essentially painting a picture that safety culture is a matter of having “the right stuff”. But how much of safety culture is a product of leadership traits if those traits do not translate into hard day-to-day decisions that are consistent with safety priorities? In other words, decision making is viewed as a process and not as discrete events. Decision making is constantly impacted by the status of all asset stocks in the business and produces a stream of decisions in response, resulting in adjustments to each of the stocks. When we define safety culture in terms of assigning the highest priority to safety consistent with its significance, we are effectively indicating how the stream of decisions should allocate resources among the various organizational assets. Part of the problem we see in various definitions or “explanations” of safety culture is in its complexity and multiplicity of attributes, values, and traits that must be accommodated. The bounded rationality aspect of a system dynamics approach stems from a belief that people can only process and utilize limited sets of inputs, generally far less than are available. 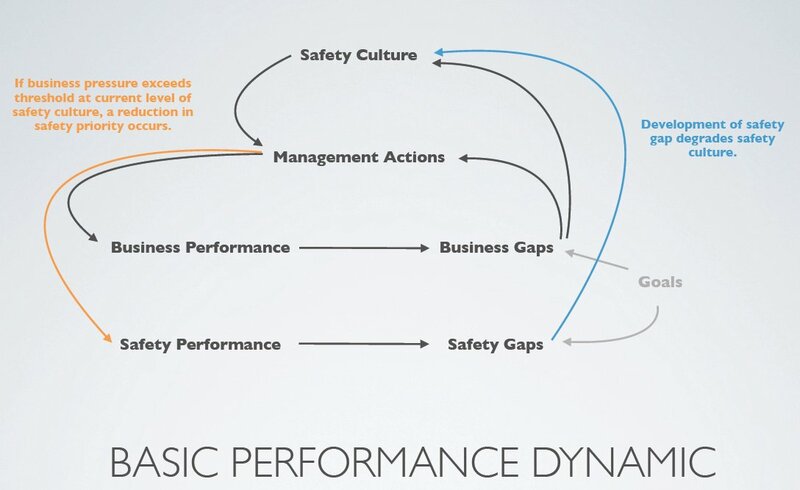 Thus in our formulation of a safety culture “model” you will see that the performance of key business assets are based on just a few key attributes that input to decisions and trigger the prioritization process. We expect some people will have difficulty viewing safety culture in terms of information flows, decision streams, and allocations of resources. However a process based model is a big step toward consideration of how to manage, measure and achieve goals for safety culture performance. * John Morecroft, Strategic Modelling and Business Dynamics (John Wiley & Sons, 2007) p. 212.